Recently I wrote a blog post urging people to join in the fight against extreme poverty. Helping just one woman achieve greater financial independence has a ripple effect through her family, her community and the ripples can extend even wider. This is one reason I support Trickle Up. I love the idea that empowering one person can cause lasting change across many lives. Trickle Up provides women living on under $1.25/day with seed capital, business skills training, savings support, and coaching so they can build a brighter future for their families. Join our campaign with support at any level to help 150 women in Guatemala become financially independent, active members of their community. In honor of International Women’s Day two weeks ago, Trickle Up launched an Indiegogo campaign to transform the lives of 150 women (and their families and communities) in Lachua, Guatamala. The huge news is that in just that much time over $10,220 has been raised–40% of the total goal of $25,000! That is tremendous news, but that also means that 60% of the money is left to raise and it gets harder as time goes by. If we have raised 40% of the goal, does that mean we can only hope to change 40% of the 150 women’s lives that we had hoped to change? Are those women simply out of luck? These are women who live on almost nothing each day and they worry how they can feed their families. They are living without any safety net between them and the people they love and disaster. Yet so little can do so much. Literally, for the cost of a cup of coffee at a fancy coffee store, one of those women can have a chance at an independent life. Give today. Learn more and donate at http://igg.me/at/trickleup. If you haven’t already, please join me in supporting Trickle Up’s amazing work helping families in Guatemala chart a new trajectory for their future. Please share this post with your friends and post to Facebook. Help us reach the goal of helping 150 women to a better life. We celebrated Pi Day by buying an enormous Cherry Pie at Costco. Peter ate most of it. I am not a huge pie fan. I am, however, going to knit a Pi Shawl for next Pi Day. I already have spun the yarn and chosen my patterns so this is just the goal I need to get started and aim for completion. Thank you, Glenna C. Oh, and any reminder of the Great Elizabeth Zimmerman is all right by me, too. My fourth Pi shawl is done, I’m pleased to report, and it even made it just under the wire for Pi Day on Saturday. 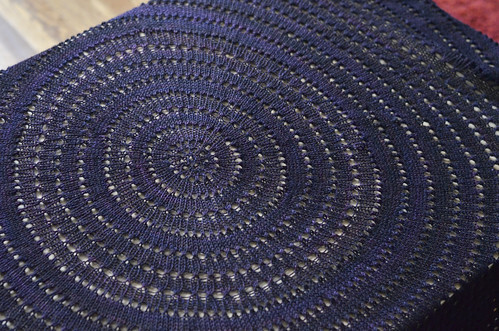 I cast off around lunchtime and laid it out for blocking that afternoon, and I am well pleased. How long does it take to knit a Pi Shawl? Some things a woman just has to do on her own and this weekend was the moment. 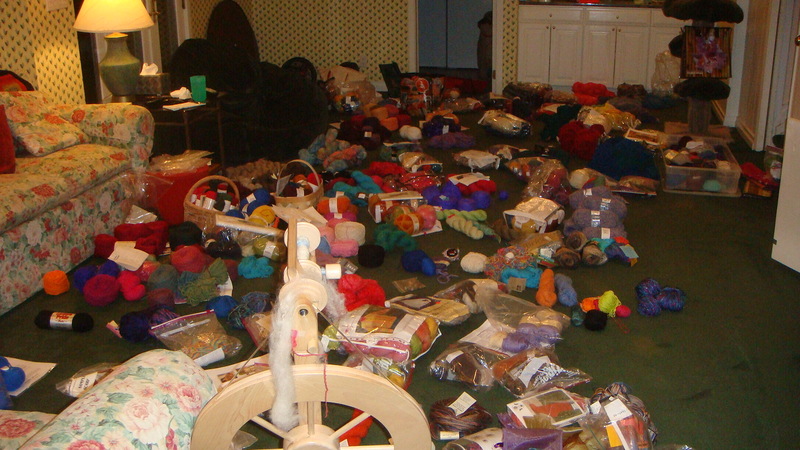 For weeks I have been half-itching, half-dreading getting all of my yarn out from its various hidey holes and storage places, spreading it across the room and seeing just exactly how much and what I have on hand. Is it as bad as I think? 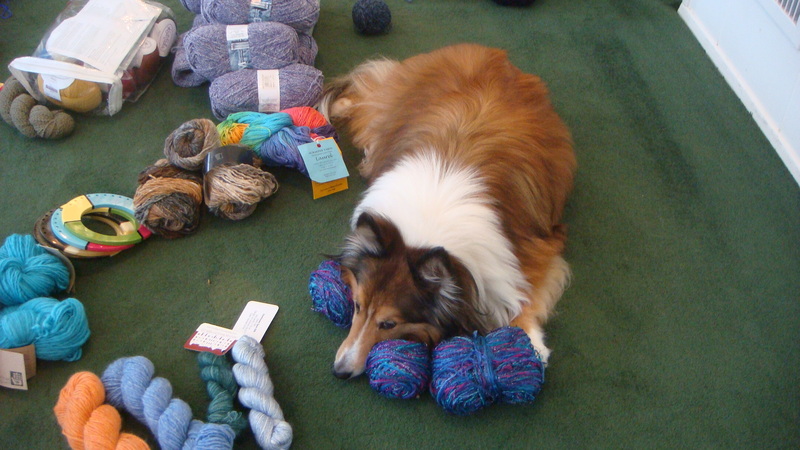 Could I truly open a yarn store with just what I have on hand? 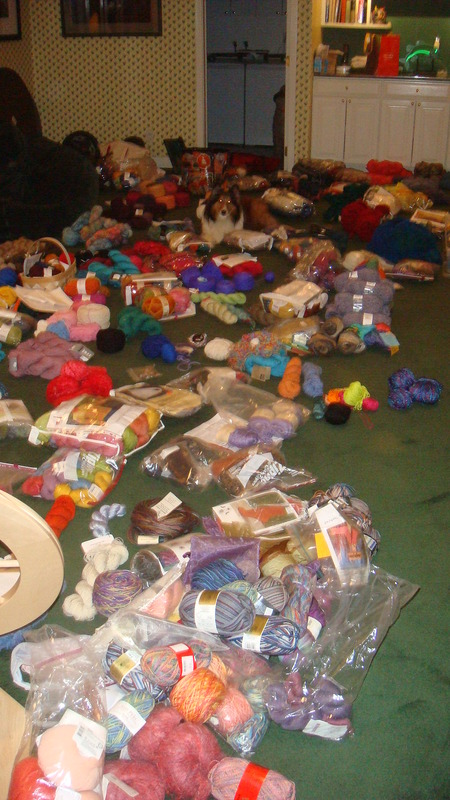 Is there yarn which was acquired at some point in time about which I have completely forgotten or do I have a good handle on my inventory? I always love the feeling of wanting to make something and finding just what I need on hand. Could I have that feeling even more often? going on. We went up to bed. I guess we were both wondering what I had gotten us into. 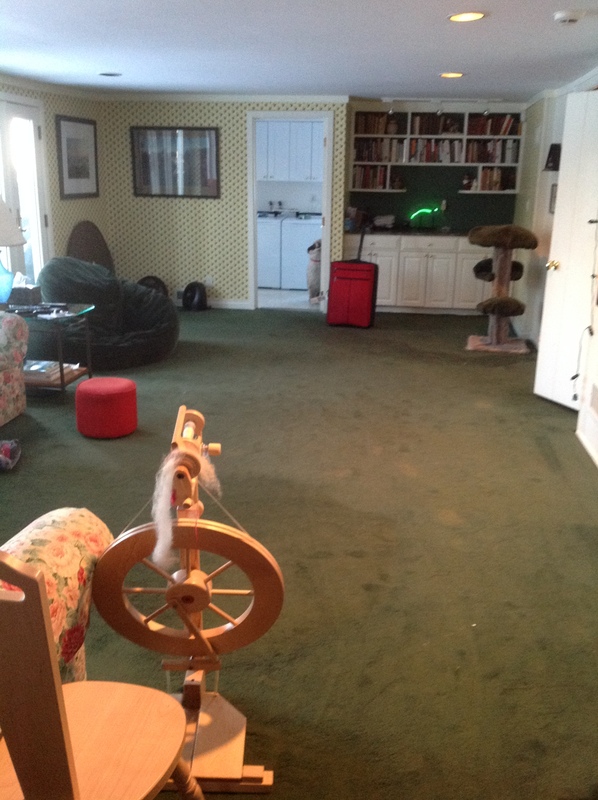 It was a tremendous relief Saturday morning to see that the kitties had not touched a thing in the maelstrom of fiber. Good kitties. You can tell they grew up in a house of strings. They know better. I started tentatively picking at the piles. I tackled sock yarn first. In just a few minutes I had a gorgeous drawer filled neatly with all of my sock yarn. That was the trick. Just take one thing at a time. Soon I had a drawer devoted to lace weight yarn, a plastic bin just for bulky and semi-bulky and another filled with worsted weight. Two ridiculously large bins featured sweater kits–I will never freeze. Another bin held odds and ends. Luckily, I had help in the form of my faithful hound. He knew just what to do. When you have a snout this long, you gotta rest. A ball of yarn is just what the doctor ordered. Not a trace of the disarray. The secret of my long term over-indulgence is safe and only you and I know how bad it really is…psst don’t tell.